I've been wanting to read Between Shades of Gray since I laid eyes on it years ago. And finally, I did! An inspiring and moving story about hope, survival and love. Set in 1941, Between Shades of Gray tells the story of Lina and the other Lithuanians, and how they suffered in the hands of Russians- how they persevered, fought, faded and survived. This was the first time I read about the deportation of Lithuanians (as well as of Estonians, Latvians, and Polish). I've read a lot about the Jews, the labor camps, the Holocaust, but never of those (non-Jews) who suffered under Stalin's hands. Based from the stories of the families and friends of survivors, and of the survivors themselves, Between Shades of Gray was able to show the different faces of humanity, especially in times of adversity. The events blend in together, and each of them brings about emotions. I liked how the book is full of meaning- of what it means to live, to survive, to hope and to love. I liked how art was incorporated into the story and how Lina uses her talent to express emotions and show experiences. And of course, the little flashbacks of Lina's memories from before the deportation. Each flashback follows and is in relation to what Lina is currently thinking and/or experiencing. It made Lina more relatable and her experiences more heartbreaking. The ending was a bittersweet one. It was open-ended but perfectly understandable. It would take more than a book to read the stories of the deportees and refugees. But overall, plot-wise, Between Shades of Gray is definitely worth reading. Aah the characters! Lina, the main character, is smart, talented and brave. She's easy to relate to and very likeable despite her shortcomings. The other characters are also well-written: Jonas and Andrius, who despite being young like Lina, were able to show courage and were able to face the difficulties that lie before them; Lina's mother, Elena, whose love not only for her family but also for other people is truly inspiring; the other deportees whose resolve may have weakened but still supported each other; and even the Russian soldier, Kretzsky, who did not forget his heart despite the war. The story is told in the eyes of Lina, a 15-year old girl who at a young age, tasted what it's like to be in the face of death. When the deportation started she's at that point in life when she's starting to figure out her future; thus, making the story-telling quite raw and innocent but deeply moving. Overall, I loved the style of writing. The fluidity and relevance of the events, how each events relate to the others, and the strong, three-dimensional characters. Between Shades of Gray is indeed beautifully written. I definitely recommend Between Shades of Gray. It's such a bittersweet, inspiring read; and I can definitely see myself rereading this in the future. 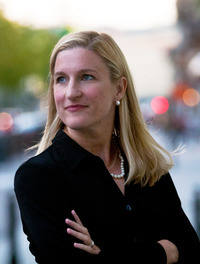 Ruta Sepetys was born and raised in Michigan in a family of artists, readers, and music lovers. As an author of historical fiction, Ruta is drawn to stories of strength through struggle. Her award-winning debut novel, "Between Shades of Gray" was inspired by her family's history in Lithuania and is published in 45 countries. Her second novel, "Out of the Easy" is set in the French Quarter of New Orleans in 1950, and her third novel "Salt to the Sea" exposes one of the greatest hidden disasters of World War II. Ruta lives in a treehouse in the hills of Tennessee.